Peninsula College's NWAC All-Star and All-Academic center back Halle Watson signed a national letter of intent February 28th to play for Division I University of San Francisco. Former PC Women's Soccer player Myu Ban, who lead the league in assists and scored goals in both the Quarterfinals and Semifinals as a Pirate in 2015 shines in Sydney with the Manly United Football Club. 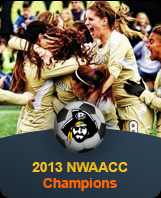 PC Women's Soccer brought home another Division Championship, this is the eighth straight league championship! PC Women's Soccer Team brought home multiple NWAC awards for the 2018-19 season. Tatiana Hagan Signs to Division I University of Kentucky! Tatiana Hagan a PC midfielder signed a national letter of intent to continue her colleigate soccer career at Division I Univeristy of Kentucky.